Fusion Bonded Epoxy (FBE) coating system is an externally-applied thermosetting resin for pipe. It is applied in the form of a dry powder at thicknesses of 400-600 microns onto the heated surface of the steel pipe. 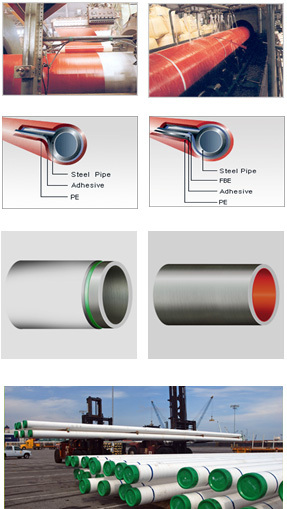 Three-layer pipe external anti-corrosion system consists of a layer of high-performance Fusion Bonded Epoxy onto which a co-polymer adhesive layer is extruded, followed by a layer of extruded polyethylene or polypropylene until the desired thickness is obtained. To protect internal pipe surfaces from corrosive and erosion effects as well as reduce friction and turbulence to increase flow efficiency. The coating also acts as protection while in storage and during transport.